In the last two years, Nevada courts and the Nevada legislature have made significant decisions regarding non-competition agreements. It is well known that courts view non-competition agreements with a higher degree of scrutiny than other kinds of agreements because of the seriousness of restricting an individual’s ability to earn an income. Only restrictions that are reasonably necessary to protect the business and good will of the employer will be enforceable. Is your agreement supported by valuable and appropriate consideration? In other words, have you given the employee something valuable in exchange for the employee signing the agreement? Depending on the circumstances, this “something valuable” could be initial employment, continued employment, or a change in the terms or conditions of employment. Does your agreement have a reasonable time limit? Courts will evaluate the specific facts regarding your business to determine what is reasonable. In general, an agreement that restricts an employee’s ability to earn an income for 1-2 years is likely to be viewed more favorably than an agreement that imposes a 5-year restriction. Does your agreement have a reasonable geographic scope? The geographical scope of a restriction must be limited to only the areas where the employer can provide evidence of established business interests, i.e., areas where the employer has established customer contacts and good will. Courts will closely scrutinize evidence of those business interests and, generally, restrictions that are phrased in terms of miles will be more well-received than those phrased in terms of states. The Nevada Supreme Court has held that doing business in 33 states does not justify a nation-wide restriction, and has suggested that doing business in one city does not justify a state-wide restriction. Does the restriction impose an undue hardship on the employee? This is the flip-side of the above questions, viewing the matter from the employee’s perspective. Does the agreement prohibit the employee from working in his or her chosen profession? Require the employee to change professions? Require relocation? Arguably, any non-competition agreement is going to place a burden on the employee, and the focus should be whether therestraint is excessively burdensome. Does your agreement prohibit a former employee from providing service to a client who chooses to follow the employee? A new law that became effective in June of 2017 expressly states that if a client chooses to follow the employee, the employee does not solicit that client, and the employee is otherwise in compliance with the agreement, it is not a violation of the agreement to provide services for that client. Does your agreement contain other provisions? A comprehensive non-competition agreement may include other provisions such as non-solicitation of clients, non-solicitation of employees, and prohibitions on disclosure of trade secrets and confidential information. Are there any other special circumstances you need to consider? 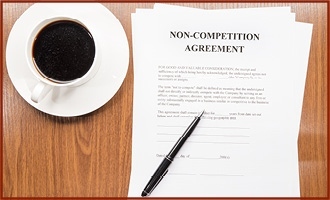 There are a host of other issues that come up related to drafting and enforcement of non-competition agreements. Take care to consider special circumstances your business may be facing, such as a reduction in force, reorganization, restructuring, asset sale, or other circumstance specific to your business.